Joan McRae is an extraordinary woman who has lived a very interesting life. As a survivor of the London Blitz and a War Bride, she has dozens of stories to tell. And, at the age of 100, she continues to be active and involved in life. For us at The Ottawa Mission, this includes translating her strong compassion for the plight of homeless people into action. As a faithful supporter of The Mission over the years, Joan has helped change many lives. She has supported a number of important projects, including education programs and second stage housing for men in recovery. Most recently, Joan made a contribution to our new offsite residential addiction treatment facility called LifeHouse. After attending the recent official opening of the new LifeHouse, she says that she is most impressed with it, and is proud to be a part of a project that will bring joy and hope to so many. 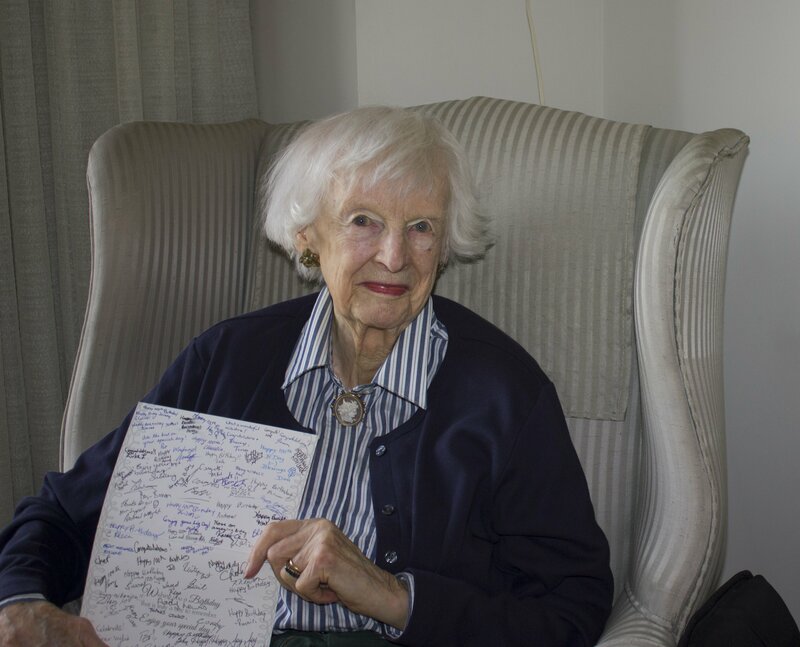 As a token of our gratitude, on Joan’s 100th birthday 100 staff, clients and volunteers at The Mission signed a birthday card for her (see photo) and she really treasures this special gesture. Thank you and God bless you Joan.